Staff shortages could derail the Scottish government's £100m cancer strategy, a new report has warned. The blueprint for improving care for the 32,000 Scots diagnosed with cancer every year has made significant progress in areas such as prevention and improving survival. But there is a lack of clinicians in key areas such as radiology. This is slowing down the goal of getting more cancers diagnosed and treated quicker. The report - produced by a cross-party group of MSPs, charities and patient representatives - examines the effectiveness of the Scottish government's five-year cancer strategy at its halfway stage. It shows the majority, 47 out of 54, of the strategy's actions have been completed or are on track, but some critical objectives around staffing are at risk. The report raises concerns that "at the current pace the strategy will not be fully implemented by March 2021". Gregor McNie, head of external affairs in Scotland for Cancer Research UK which helped to put the report together, said: "A great deal of progress has been made in the implementation of the strategy and we're really pleased to see the Scottish government is on course to meet its £100m funding commitment. "However, significant staffing shortages remain a serious concern and the Scottish government must now plan and deliver for a fully resourced Scottish cancer workforce both now and in the future." 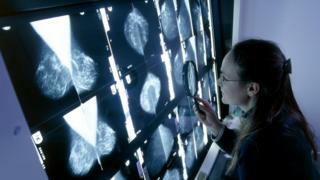 About 32,000 people in Scotland are diagnosed with cancer every year, a number that is expected to reach 40,000 by 2027. Action on obesity, smoking and excessive drinking has been praised by the cross-party group on cancer. But "significant concerns" were raised about the long-term sustainability of Scotland's diagnostic workforce.One staffing objective missed was a plan to increase the number of nurse endoscopists by 40% by 2017. A number of health boards across Scotland have reported shortages of consultants and other cancer specialists, resulting in lengthier waiting times in some areas. Tory health spokesman Miles Briggs MSP, co-convenor of the cross-party group, said: "While there has been welcome progress in the implementation of the cancer strategy in a number of areas, this report highlights that there is still significant action that is needed to ensure the strategy is fully implemented by March 2021." Delia Hall, a former nurse, was diagnosed with cancer of the kidney in October last year. Her cancer is treatable but the longer she waits the more likely it is to spread. A surgical procedure to remove her kidney has been delayed, with no rescheduled date due to staffing shortages in Aberdeen. As NHS Orkney only has a contract with NHS Grampian, she is currently unable to seek treatment elsewhere. She told the BBC: "Nothing is happening. I have breached the 62 days' waiting time set down by the government and I still have no operation date in sight. "I have been told by my consultant there is a nursing shortage at Aberdeen Royal Infirmary. "It makes me feel very angry because there is a potential cure. "I am sure that people have died and people are dying now. Possibly I will die because of this. "It makes me frustrated and angry and I feel very let down by the organisation that I worked in. "And I just feel so impotent that I can't do anything about it." Labour's Anas Sarwar MSP, co-convenor of the cross-party group, said: "This report must serve as an urgent wake-up call for the Scottish government. The laudable aims of the cancer strategy simply can't be delivered unless the staffing crisis in our NHS is addressed." A Scottish government spokesman said: "We continue to monitor progress of our five-year £100m cancer strategy and we recognise the challenges in staffing resource for cancer services. "The health secretary is meeting the Scottish Cancer Coalition on Thursday to discuss with them aspects of the strategy. As the cross-party group's report recognises, 87% of the actions in the strategy have either been completed or are on-track. "We recognise there can be challenges in recruiting the right specialist staff for some services. That's why the Scottish Cancer Taskforce is feeding into the development of the Scottish government Integrated Workforce Plan, which aims to address workforce needs across Scotland. "Under this government there has been a 66% increase in consultant oncologists and a 45% rise in consultant radiologists in Scotland's NHS - which as a whole has seen seven consecutive years of growth in workforce numbers, to historically high levels."